The cache memory is defined as the first level of memory after the Registers. In the memory hierarchy, it is placed right below the processor registers as shown in the figure above. 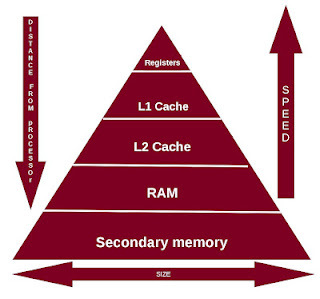 The above diagram shows the position of the Cache memory based on the Speed, Distance from the Processor and the Size. How the Processor check for the data? The cache is generally made up of SRAM because of the high speed of operation of SRAMs and the faster a cache operates, faster data can be made available to the processor for processing. The cache stores in it the data of memory locations that the processor uses repeatably or is expected to use very soon in future. When the processor wants to access data of a certain memory location, the data might be present in cache or not, this is defined by the terms cache hit and cache miss respectively. When the processor does not find, the memory location which it wants to access, stored in the cache it has to fetch the data from the main memory. As the data is missing in the cache this is termed as a cache miss. If the memory location is present in the cache, processor can fetch the data from cache itself and need not go to the main memory to fetch it. This is termed as a cache hit. A memory location accessed once will be accessed again soon and hence need to be stored close to the processor. This is an assumption and if the same data is required in the near future, we can save time by doing this. The memory locations around the memory that the processor accesses might also be accessed by the processor soon and hence need to stored close the processor in the cache.This is also based on an assumption and we believe that the data next to the current location will be required for the next computation. I think this below 3 Dimensional Diagram will make the Memory Hierarchy much more clear to the readers. The address of the needed data is formed in the processor execution or instruction-fetch unit. Most addresses are then mapped from virtual to real through the Translation Look aside Buffer (TLB). Certain ranges of addresses are not mapped, and bypass the TLB. Most addresses are presented to the primary cache, a cache in the processor chip. If a copy of the data with that address is found, it is returned immediately. Certain address ranges are never cached; these addresses pass directly to the bus. When the primary cache does not contain the data, the address is presented to the secondary cache. If it contains a copy of the data, the data is returned immediately. The size and the architecture of the secondary cache differ from one CPU model to another. The address is placed on the system bus. The memory module that recognizes the address places the data on the bus. Everybody is talking about microservices. Industry veterans may remember monolithic or SOA-based solutions being the way of doing things. Times have changed. New tools have allowed developers to focus on specific problems without adding excessive complexity to deployment or other administrative tasks that are usually associated with isolated services. Thanks for providing such a great information.I ‘d mention that most of us visitors are endowed to exist in a fabulous place with very many wonderful individuals with very helpful things. This is an awesome post.Really very informative and creative contents. These concept is a good way to enhance the knowledge. This blog is wonderful i like studying your posts. Keep up the great work! 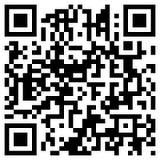 You understand, lots of persons are hunting around for this info, you could help them greatly.